Cook the delicious Thai classic in 30-40 minutes without having to track down exotic ingredients. On Maha Chai Road in Bangkok's Old City, the line to get into a certain pad thai place already stretches down the street an hour before it opens. Make it at home in just 30-40 minutes with Rachael Lake's vegetarian kit. No searching specialty markets for palm sugar, tamarind, or Thai chili: Every ingredient you need, including tofu, is inside the box, in just the right amounts to achieve the ideal Thai balance of sweet, tangy, salty, and sour. The box's contents are shelf-stable, so no worries about wilting or spoilage. If you'd like to add eggs, bean sprouts, carrots, etc., the easy-to-follow recipe card tells you how. Low in effort, high in satisfying flavor, it'll impress everyone you make it for, including you. Makes four adult servings. Hand assembled in Sunnyvale, California, from global ingredients. Makes about 4 meal servings. This does make a delicious Pad Thai and I enjoyed the final product. However the instructions are not easy to follow and measurements of ingredients that are provided are not given so you can not remake the recipe. Nice for a first time purchase to make pad thai but I won't be buying any more of their products. Innovative gift for a person who likes to try new things. This was a Christmas gift for my daughter and granddaughter. They both like Pad Thai and I thought the concept of everything already for meal prep was convenient. 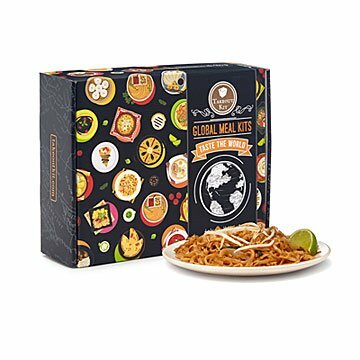 Great kit that comes with everything you need- whether you're a vegan or not to make a great Pad Thai. If you are a meat eater just add your own protein to the dish.